Nothing beats the look and feel of good quality leather luggage. It might not be the most practical luggage choice anymore as leather is heavier than most other luggage material available these days. However, leather is extremely durable and it always looks luxurious. It is difficult not to feel special and privileged with good leather carry on luggage in tow, not to mention if you lucky enough to own your own leather luggage set. Which Leather Is Best For Luggage? The most important thing to have in mind if you are considering buying quality leather luggage is the leather itself. Leather is a durable and flexible material created via the tanning of animal rawhide and skin. The types of hides and skins most often used in leather manufacture are from cattle, sheep, and pigs but leather can be made from most animals' skin, i.e. lamb, deer, snake, kangaroo, etc. Leather tanning is the process of converting raw hides or skins into leather. There are several tanning methods in use but the method used affects the texture and coloring of the leather. Hides and skins have the ability to absorb tannic acid and other chemical substances that prevent them from decaying, make them resistant to wetting, and keep them flexible and durable. All above leather types are used in luggage but the quality and price varies. Full grain leather is the most expensive and then top grain leather, both qualify for use in high-end quality leather luggage (different texture, different taste). Corrected grain leather is frequently used in the less expensive leather products that comprises the majority of leather produced worldwide. When looking for good hardwearing leather that is easy to clean and at a reasonable price, then corrected grain leather is a fine choice. Check in luggage made from leather is less popular than leather carry on luggage, mainly due to the rough handling that check in luggage must be able to withstand. Leather luggage and accessories on the other hand are extremely popular choices and there are different types available to cater for different tastes and budgets. Leather luggage can sometimes be quite masculine / conservative looking but manufactures are increasingly offering more leather luggage that appeal to those that prefer more feminine or trendy look. 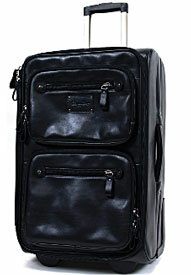 The conservative / timeless leather carry on luggage look tends to be popular by executive business travelers. You can get great looking leather luggage set, i.e. leather carry on luggage and leather laptop briefcases from the same manufacturer. Quality leather luggage does not come cheap but it can last you for life if you maintain it properly. Leather is very durable material but it can be delicate, especially towards water and moisture. This is why you cannot wash leather or use soap and ordinary cleaning detergents on it. Never use solutions used to treat luggage made from nylon or polyester as they may cause some chemical reactions in the leather and destroy its natural look (even solutions that initiate resistance on water, stain and dirt). Most leather can be oiled to improve its water resistance. Frequent oiling of leather (with mink oil, neat's-foot oil or a similar material) keeps it flexible for longer and can improve its lifespan dramatically. It is important to oil it regularly to maintain its' natural moisture level, otherwise you risk getting cracks in the leather. When cleaning finished leather, you should use special leather cleaner. You can get them from a local shoe repair store but ideally check with the manufacturer before buying anything. You can also buy special leather spray to maintain the color of the leather (just make sure the product has the same color as your quality leather luggage before applying it). The better quality the leather in your luggage is and the better you maintain your quality leather luggage, the longer it will look and feel pristine. If your leather luggage gets grease stain use talcum powder to remove it. Just sprinkle it over the greasy area and leave it for at least four hours. The talcum powder will absorb the grease - the only thing you have to do is to wipe the powder off using clean cloth. Also, avoid storing your leather luggage in tight and humid place as it can cause the leather to deteriorate. So what are the characteristics of the best leather luggage? It is a bag made from full grain leather. If you need your leather luggage with wheels, make sure it is fitted with in-line skate wheels because they are the most durable and give the softest ride. For higher quality leather luggage brands, you might want to consider bags made by Clava, Kenneth Cole or Tumi.